Hi Everyone! It is designer April here today. I know everyone has been sweltering from the heat. I have made a card to go along with that. The theme for our challenge this month is stripes, so I made this card using stripes from the sun beams. To make the background I "stamped" using an embossing folder. 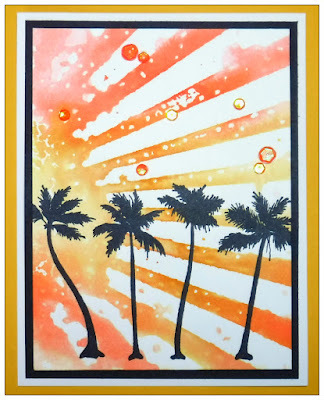 I swiped yellow and orange colored ink pads over the raised part of the embossing folder, spritzed lightly with water, placed my card stock over the inked part, closed the embossing folder and pressed it firmly with my hand. Over the background I stamped the Wind Swept Palms Silhouette stamp. Sequins were added on the top half of the card. You still have a few days to join in the challenge. We would love to see your project using stripes. Thanks so much for stopping by. Keep cool and have a great day! Fabulous April! I love the watercolor look the embossing folder gives. May you be blessed with cooler weather soon. This is just wonderful! Love it! April, this is sizzling hot!